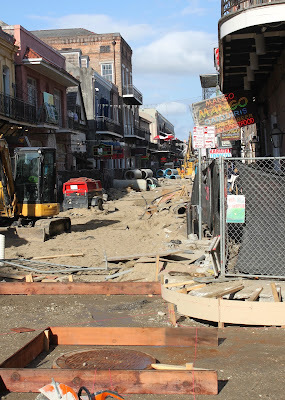 Visiting the city of New Orleans during the Veteran's Day holiday weekend revealed that Bourbon Street is very much under construction, complete with heavy soil disturbance to rebuild infrastructure underneath this major artery of the French Quarter. 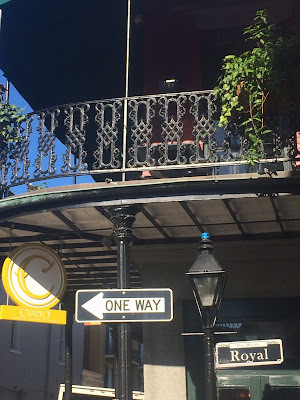 But when one door is closed, sometimes another is opened, and I took the Laissez les bons temps rouler attitude over to explore nearby Royal Street. Besides discovering several savory places to dine for local cuisine. I found impromptu jazz bands playing in Royal Street, with other artists giving performances at each street corner. In short, Rue Royal is shining during this time when Rue Bourbon is mostly a construction site. Highest recommendations go to these Two Sisters!! With so many did options it is wise to receive input about what kind of experience you are looking for during dinner. 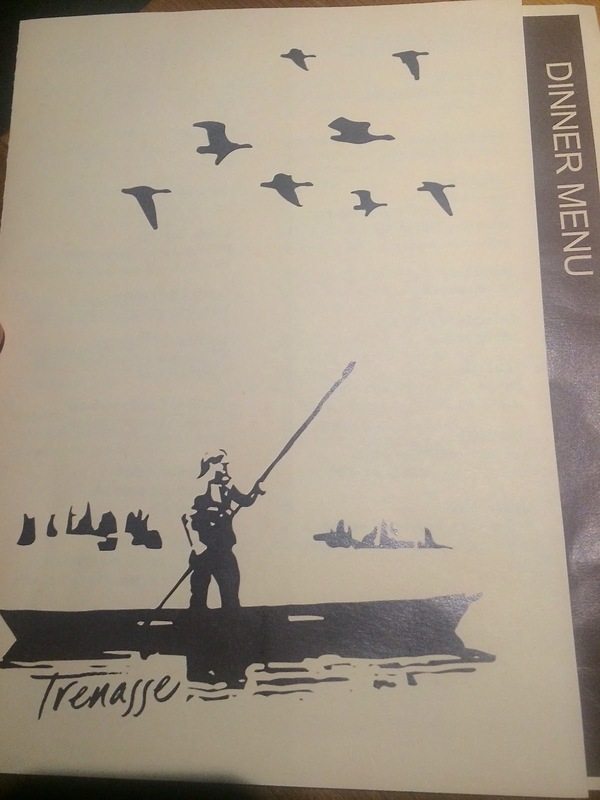 The first visit was to Trenasse Restaurant which is located at the Hotel Intercontinental at 444 St. Charles Avenue (which is an extension of Royal Street.) Tranasse is defined as 'a trail in the marsh that will lead to the best fishing' and the artwork on their menu depicts this scene and even adds a few waterfowl flying overhead. The meal got off to a great start with an order of their Oysters Intercontinental on the half shell, which ended up being the best I tasted. The sportsman in me dove into the Rabbit and shrimp fricassee next and enjoyed sopping up every bit of it with my appetizer of loaf bread. Next up is a new eatery called Curio, located at 301 Royal Street. Curio offers a bar downstairs with some lunch and dinner tables downing said. The second story holds a more refined dinner area, and is much quieter for polite dinner conversations. Choosing to embrace the second story patio dining proved to be a master stroke, since the outside temperature was cool without any significant breeze. I started with the Roast duck and Black-eyed pea gumbo with Poche's andouille and popcorn rice, which warmed me right up. A pan-roasted red grouper was served over kale, garlic rice and pecan butter sauce. The Dessert offering called Coffee and Doughnuts proved to be quite a tasty surprise when Cafe au last creme brûlée was served along with beignets, and it was delicious. No visit to the Big Easy is complete with a Jazz brunch at The Court of Two Sisters, located at 613 Royal Street. The structure here was built in 1832, but the spacious courtyard (which resembles the Garden Distric) is complete with ancient grape arbor and a wishing well with running water. Once seated, the server takes your drink order and then you are free to visit the salad bar, custom omelette bar, hot food bar and dessert bar until you reach a comfortable stopping point. For anyone that likes to mix up tastes of food on your plate this is a great place to dabble in dishes such as Duck L'orange, Catfish roulade, Cajun jambalaya, Shrimp etoufee, Crawfish Louise, Veal grilled, Andouille gumbo, plus Shrimp and corn macaque Choux. All the while, the three-piece jazz band played the classics softly enough to entertain without intrusion, and nature watchers might even spy a few birds flitting about in the courtyard. 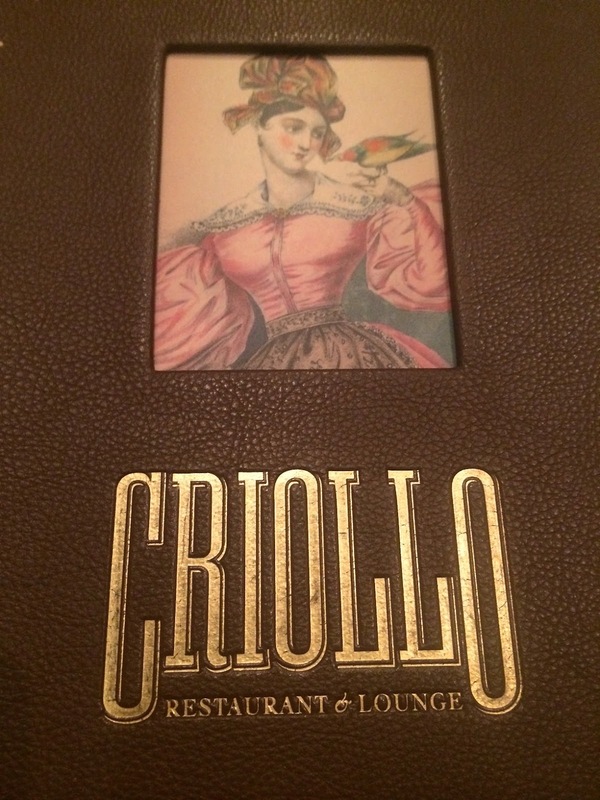 Lastly, Criollo Restaurant at 214 Royal Street is located inside the Hotel Monteleone. Many will know this same location since it is famous for the Carousel Bar that hosts jazz music nightly. I found the menu to be somewhat limited and chose to eat their Colorado land shank, cooked to medium well. The entire dish including the carrots and au jus was too bland for me, and I requested a salt shaker to bring some life to the dish. Our seating area was in a 'live' room with a larger party next to us with more than a few wine bottles on it, and they were simply too loud and raucous for the dinner hour. Skipping dessert and moving on seemed prudent, but I hope to get another chance to visit their restaurant. To view past blog entries from dining in New Orleans click on 2013 or 2013 Photo Journal.